Mia was first rescued a year ago, when she was found abandoned in a garden in Doncaster, crying loudly because she was in labour and had nowhere to go. Without hesitation, devoted cat rescuer Sheila B agreed to take her in, raised the three kittens and soon found them good homes. 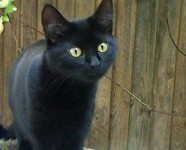 However, it took an entire year before someone wanted to adopt Mia, who like many black cats, seemed to be left behind. Although Sheila loved Mia dearly, she let her go to her new home because it was best for her. So, after a home check, Mia was collected on a Friday night. The next morning the telephone rang: Mia had escaped through the cat flap during the night because a vital door had been left open. Her new owner had searched everywhere and called her for over two hours, but there was no sign of Mia. Sheila set out immediately, searched the area with the help of friends and called her name, but there was still no sign of Mia. It was bitterly cold and Sheila felt she had let her down. Then there was heavy snowfall during the night and it was only thanks to a friend with a big 4×4 that the search could continue. They put up posters and leafleted through letterboxes, but all to no avail. Sheila spent a total of four days freezing in the new owner’s garden with the feeling that she was never going to see Mia again, because the cat did not know where she was and had nowhere to go back to. After five days into the search, I received a telephone call with the news of Mia’s disappearance: was there anything else that could be done to find her? As fate would have it, I had just come back from the successful recovery of a lost cat, and still excited about the success of that rescue, I suggested the following: Sheila should take the contents of her vacuum cleaner bag and empty it on a big plastic sheet in the woman’s garden and leave it there as long as there was no rain or snow forecast. The fine dust can rise high up and travel over walls and fences reach the cat’s delicate nose and indicate the direction “home”. Surprisingly, this trick has worked several times, sometimes within an hour, since I learned of it a few years ago. So, Sheila went back to the lady’s garden, this time equipped with the dust, a kennel, shoes and clothes that carried her scent and the cat’s blankets, all smelling of home. She made trails from the dust heap into the kennel and onto the bedding, making a path from cardboard to keep the dust dry; she even filled up a hanging basket with the precious powder. When fresh snow was forecast, Sheila drove out to the site and picked everything up, only to put it back the next day. On day six, there was finally a breakthrough: when the owner went into her garden in the morning, she saw Mia dashing out of the kennel! What a relief to know that Mia was okay – but now she needed to be captured. Although Mia is the most easy-going, affectionate domestic-born cat, her inbred wild instincts had taken over in this crisis situation. Thus, she likely wasn’t going to approach anyone for a while, perhaps not even for weeks. Meanwhile, she had become very thin; so, Sheila did the obvious thing and inserted a trap into the kennel, lined with thick warm blankets and woollen garments. The result: Mia was trapped the same night.